This book explores the diverse ways in which disability activism and advocacy are experienced and practiced by people with disabilities and their allies. Contributors to the book explore the very different strategies and campaigns they have used to have their demands for respect, dignity and rights heard and acted upon by their communities, by national governments and the international community. The book, with its contemporary global focus makes a significant contribution to the field of disability and social justice studies, particularly at a time of major social, political and cultural upheaval. 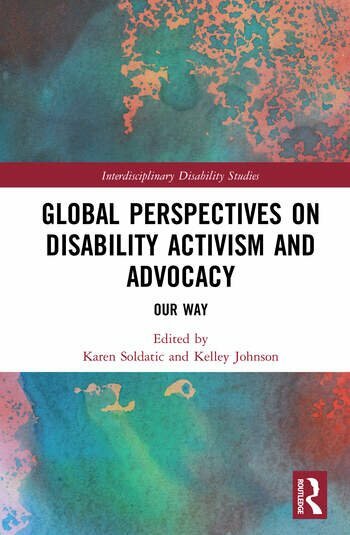 Global Perspectives on Disability Activism and Advocacy offers a significant intervention within the field of disability at a time of major social upheaval where actors, advocates and activists are seeking to hold onto existing claims for rights, equality and disability justice. Karen Soldatic is an Associate Professor, School of Social Sciences & Institute Fellow, Institute for Culture and Society, Western Sydney University. She was awarded a Fogarty Foundation Excellence in Education Fellowship for 2006–2009, a British Academy International Fellowship in 2012, a fellowship at The Centre for Human Rights Education at Curtin University (2011–2012), where she remains an Adjunct Fellow, and an Australian Research Council DECRA Fellowship (2016–2019). Her research on global welfare regimes builds on her 20 years of experience as an international, national and state-based senior policy analyst, researcher and practitioner. She obtained her PhD (Distinction) in 2010 from the University of Western Australia. Kelley Johnson holds honorary professorial appointments at Deakin University and University of New South Wales (UNSW) in Australia. She is an internationally known scholar who has been a researcher and advocate with disabled people for more than 20 years in Australia and internationally. Her recent previously held positions include Director, Social Policy Research Centre at UNSW, and Director of the Norah Fry Research Centre in Bristol, UK. Kelley has an ongoing commitment to inclusive research which involves disabled people undertaking research on issues that are important in their lives. Her research interests include deinstitutionalization, community participation of disabled people, sexuality and relationships, and rights with a particular focus on the Convention on the Rights of Persons with Disabilities.